Scalby Folk Weekend is to be held on Saturday, 31 August and Sunday, 1 September this year. More details will follow including the printed programme for the weekend. Here are this year’s performers arranged so far, plus – below – something about them. Annie and King are a popular talented local duo who play a huge range of music. They are both guitarists and enjoy playing all their music in their own style. They have recently written and produced their first original album ‘When All is Said and Done’ which is available on all digital platforms. They love adding different twists to old favourites as well as to current music and their own work. They perform regularly in pubs, restaurants and cafes as well as parties, weddings and festivals in Scarborough and beyond. Beth has a love of music which embraces many genres, but her main love is discovering old “not so well known” traditional poems and folk songs which tell a story or present a message, researching their origins and bringing them into the limelight. She enjoys songs about local people and places by local songwriters both old and new, but also likes to include well loved favourites such as Dylan ,Fairport Convention, Mary Black…loads more, too many to mention here. Having spent many years in Suffolk as a regular performer at various venues and weekly singarounds she moved back “home” to the North York Moors a few years ago. She has become a member of several local folk clubs and is establishing herself in the North East. Beth is keeping very busy with appearances at The Great North Folk Festival. Whitby SeaFestival. Eye of The Wind (Richard Graingers Folk Opera). Saltburn Folk Festival. Yorkshire Day, and many more local venues, with others such as Whitby Pirate Festival and other venues further afield still to come. Beth has her own unique style, singing a capello, relying solely on her voice alone to captivate the audience with various musical folklore tales both traditional and contemporary. And finally “It takes great skill to sing unaccompanied and hold the attention of an audience. Some can do it. Many can’t. Beth Burrows can, and how!” (Tony Haynes, FAB Folk and Blues Radio Show. Tempofm.com). Bob and Linds are best known as members of York-based Alt-Celtic/Gypsy band Leather’o. As a duo they play a mix of traditional and original tunes on guitar, Celtic whistles and flute. They draw heavily on the New Celtic tradition that is revitalising traditional tunes. Cabin Fever’s rock-steady bass man is Roy Piper, well known for playing in many top line ups including Hamps Tramps and with BBC award winning singer/songwriter Anna Shannon. Anna’s songs are performed by many international folk artists. Together with talented Steve Suggitt of ‘Chapel Guitars’ who has achieved great acclaim for his quality hand made stringed instruments, Cabin Fever bring you rootsy mountain songs and authentic Cajun tunes from Americas Deep South with fiddle, guitar, bass, banjo and a wall of harmonies. You may or may not know the name, but one thing is for certain – you should. Hers is a true story of rags to – well, not quite riches maybe, but certainly success and critical acclaim in the world of contemporary acoustic- based folk/rock music. Born in Hull, Carrie developed something a local reputation while still in her teens, as an acoustic guitarist and singer/songwriter of no mean ability. Local radio support and popular live shows were left behind as she reached her twenties, however, as her stubborn nature led her into fronting rock bands as a singer, and the guitar was largely dropped. Music then became completely put aside as she abandoned it in order to raise her children, and her guitar went untouched for some two decades until a chance meeting with guitar virtuoso Gordon Giltrap changed her life. With the support and mentoring of Gordon, and also a very supportive relationship with Vintage / JHS guitars, she picked up the threads of her long‐ dormant career, with an EP, Luna, and a full-length album, What If, appearing in 2011 and 2014 respectively. While widely praised, however, these releases served as the warm up to her definitive work, 2017’s Seductive Sky album, on which she was joined by guests such as her great friend Gordon Giltrap, keyboard maestro Oliver Wakeman and legendary guitarist Elliott Randall, along with Daniel Karl Cassidy, younger brother of the late Eva Cassidy, with whom Carrie has sometimes been compared herself. With the aid of a veritable multiplicity of instruments (though not quite all played simultaneously! ), David busks out boldly where few musicians even fear to tread, peddling his strikingly individual, nay brilliantly eccentric treatments of songs you thought you’d forgotten (but now wish you hadn’t! ), from the 60s, 70s, and 80s, chart hits to altogether more folkier and bluesier material including a few originals. David is a folk singer and songwriter from Pickering in North Yorkshire. He writes story and comic songs about the people and places of North Yorkshire as well as songs about love lost and found. David accompanies himself on guitar and ukelele and he always likes to get his audiences involved by getting them to sing the catchy choruses he writes. David runs the Ryedale Songwriters Circle which aims to encourage and promote songwriting in the area through workshops and concerts. During his career David has won the BBC Radio York ‘Song For Yorkshire’ competition, the anthem writing competition for the Yorkshire Air Ambulance and the inaugural songwriting competition for the Harvey Blogg Cup at Bedale Acoustic Music Festival. Dirty Windows are a four-piece ukulele band, who push the boundaries of what is possible with 4 ukuleles, ranging from concert and tenor, through banjo and baritone to bass. Constantly challenging expectations, we play rock, pop, jazz, blues and reggae. We never play George Formby….hence our name! We have just recorded our first CD, appropriately named ‘ It Ain’t George’. You can listen to us playing our own composition on YouTube. Look for ‘Dirty Windows Death Café’. Follow us on Facebook. Greetings from Eddie Lawler, aka “Bard of Saltaire” (find the missing syllable, bollard?) now living in Scarborough. I write songs, musicals, poems and plays. My work mixes fun with ‘serious’ social comment, offering thought-provoking entertainment. “Tracking The Brontës” has arrived on the coast after lots of West Yorkshire performances. It’s been well received in Scarborough at Woodend, and at Whitby U3A. It goes to Hull U3A and Whitby Fine Arts Society in 2019. I have been playing acoustic guitar since I was 19 years old. I heard Ralph McTell’s classic song “Streets of London” on the radio and immediately went out and bought an old Spanish guitar. My journey had begun. As well as McTell, other early influences were Donovan, James Taylor, Paul Simon, Dylan and just about anyone with an acoustic guitar and a story to tell.As well as picking my way through McTell songs, I began to write my own, along with a developing fingerpicking style. I am entirely self taught and every time I pick up the guitar I am surprised and delighted by the tunes that are hiding in there! I write about social issues, about things that have happened to me, and about people I have known over the years. I have a fair number of love songs and also some slightly more “edgy” environmental songs. I love strong melodies, moving base lines, and the warm rich sound of my beloved 1954 Gibson J50. I cannot walk past it without picking it up and running my fingers over the strings! Someone once asked me if I considered myself to be a poet or a song writer. My answer was …..that I try to find poetry in my songs. Since coming to live in Yorkshire 11 years ago, I have found a wonderful thriving folk scene and play regularly in local folk clubs. I was lucky enough to win the Graeme Miles song writing contest at the Saltburn Folk Festival in 2016, and also was joint winner of the Robin Hood’s Bay folk weekend song contest in 2018. Lucy is quickly establishing herself as a top class act. Currently studying at the University of Leicester, Lucy is also in demand as a wedding singer where she performs a range of songs from a variety of genres and eras. As an accomplished ukulele player, Lucy’s voice and presentation of her songs are both charming and an absolute delight. Let me introduce myself. I am an award winning singer songwriter from Pickering. Since being a boy I have written songs and played guitar and also with others in a country rock band. By the late 1990s I realised what I wanted to listen to didn’t really exist, so I set about writing songs for my own benefit. These progressed and developed to where I am today. Writing, playing guitar and performing what hopefully other people will enjoy. Singer-song writer and quite a few other things too. Debut CD Born in the Head, CD2 Waking in the Head, on the way. Available for music and entertainment (fire-eating, stand-up, compere. talk/lectures etc). travelled from Loftus to Leicester to Liverpool and beyond. Recently been collaborating with violin players. Love songs, happy ditties, political and joke songs . . . .come and listen and jig along, it’s different. Website: www.parrotman.xyz – Links to music for listening. Recreating the exciting and varied acoustic music of 1930s America, The Rattlin Sheiks repertoire includes a wide range of popular urban and rural styles from this era including jazz, swing, rag time, old time and country. Major influences are the black string bands ‘The Mississippi Sheiks’ and ‘The Memphis Jug Band’ and also dance bands like “The Harlem Hamfats”. Music to put a smile on your face, a swing in your step and a tear in your eye. Tony Morris was brought up listening to classical music and the popular music of the 1940s and ‘50s. He did his fair share of bar room and pub singing in the late ‘50s and early ‘60s. Marriages and family intervened so he missed ‘The Folk Revival’. From the ‘80s to the ‘90s he gained a great deal of experience in Amateur Theatre. He did not appear on the Folk Club scene until the mid ‘90s when, as a poet and improvising musician, he was a regular at the Black Swan Folk Club in York. Unaccompanied English Traditional Folk, Sea Shanties and Working Songs from this amazing acapella group. As a relative newcomer to the music scene, Sophie Kelly is certainly a rising star as a performer in the singer-songwriter genre. Sophie grew up in London with influences such as Bob Dylan and Van Morrison from her father, but also the richness of Irish and Scottish folk music and gospel, which has been a strong influence in her life and in her choice of music. Initially Sophie trained at a performing arts school, and has recently turned her focus to music, playing at various open mics in Scarborough, and also singing in a duo from London, but mainly as a backing singer. Her music now is based on covers from artist such as Roo Panes, Van Morrison, and Laura Marling, and is beginning to work on her own music. Her performances are to be cherished. The Woolgatherers were first formed in 2009 when several musicians from a variety of bands playing in the Scarborough and York area got together to record some original songs written by singer-songwriter Phil Hooley. Later that year they released their first album, entitled “Long Way To Indigo” recorded and produced by Simon Wright at the Imphut Studios in York. The album, released in 2009, received impressive reviews from Sam Inglis in Sound On Sound, and also in The Link magazine. The second album “ I See”, recorded by Sam Forrest (from Nine Black Alps and The Sorry Kisses) and produced by Dave Keegan, was released in July 2013. Four of Phil’s songs, Desperate To Dance, One More, The Till and The Key have been played on BBC Radio Introducing. After several changes to the line up, the band are now in rehearsals with new members. Roy Piper, a familiar face to all fans of Hamps Tramps, has joined on bass guitar, along with drummer Dave Elvidge, who has played every music style from big band to rockabilly, and Mike Womack on guitar. Country music enthusiasts may remember Mike’s Knopfleresque guitar playing with the ever popular Country Sunshine. Survivors of the original line up, Phil and Richard Thwaites complete the line up, while other musicians such as Dave Kemp, the Rattlin Sheiks and Pete Everett often make guest appearances. While currently writing new material, the band are also reworking some of their old songs, and include their own interpretation of some classic country covers in their live set. The new line up went down a storm at Staxtonbury, and they have already been booked for a further appearance on the main stage in 2019. The Woolgatherers have also appeared at various country shows and at the annual CAMRA festivals in 2016,2017 and 2019. In November 2018, Phil supported Chris Difford as part of his solo tour. We are always happy to welcome new members, dancers and musicians. If you’d like to come and join us at a practice to try it out, please call or email us. We meet on Thursday evenings, for practice in Scarborough from September to May, and dance out locally in the summer. We do, of course, dance at weekends and special events on other days. Scalby Fair and the Nag’s Head win! Scalby Fair Committee put up the village Christmas tree, just outside the Nag’s Head, every year. Permission to place the tree and lights is kindly given by the Nag’s Head. Once again, the combination won first prize in the annual Christmas Lights Competition, jointly sponsored by Newby and Scalby Parish Council and Proudfoot Food Stores. The cash prize will be used to augment the prizes for the Scalby Walk later in the year. The Fair Committee is deeply appreciative of County Councillor Derek Bastiman for his support in providing a grant from his County Councillor Locality Budget towards the cost of providing new storage racking for the Fair’s equipment. How does it benefit the community? The new racking ensures we can carry on the Fair and increase the longevity of our equipment and also ensures the equipment is safe to use and more easily accessible. It also bodes well for the long term continuance of the Fair which is generously supported by the local community, as well as the wider community, thus ensuring the Fair plays its part in bringing the local community together and thus plays a part in promoting the health and wellbeing of the Community. 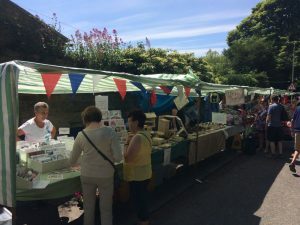 Scalby Fair is enjoyed by the young and not so young alike and many people eagerly look forward to Scalby Fair Week and its many attractions, especially the main Fair Day with its 40+ stalls and entertainment for all ages. The Fair keeps alive the traditional fair of old and combines it with current attractions thus making it as relevant today as it was when Scalby Fair officially started in 1978. Without our equipment, and without it being in good order, we could not possibly ensure that the Fair is staged each year. The Committee thanks our fellow committee member Mick McGuinn whose determination drove the idea forward and he designed, organised and built the racking with assistance from fellow Committee Members. Once again we give grateful thanks to and appreciate the support of County Councillor Derek Bastiman and North Yorkshire County Council for their grant without which this project would not have been completed. Great music from Friday, 31 August to Sunday, 2 September at the Nag’s Head. All proceeds to be donated to Martin House Hospice for Children.